Just as libraries have been steadily overtaken by technology – in the form of computerized indexes, so too are bookstores now being drawn into the techno vortex. Commentators have alternately speculated about the death of the book retailer and also a coming renaissance in book selling. Bookstore goes multi-format – Bookstore becomes multi-format selling e-books and print books together. Barnes & Noble is already headed in this direction. Customers might purchase a combination of e-books and p-books; an e-book to read on the airplane during a business trip, and a p-book to be sent as a gift for a friend’s birthday. Library as bookstore – Libraries, strapped for cash during the Great Recession, might use an Espresso Book Machine to let patrons print and purchase a book they really like. Or they sell older copies as used at a big discount and replace them with fresh copies. Bookstore everywhere – Print or download at the point of purchase vending machines with built in Amazon style search capability could someday replace the retail bookstore and make bookselling as ubiquitous as snack dispensing. 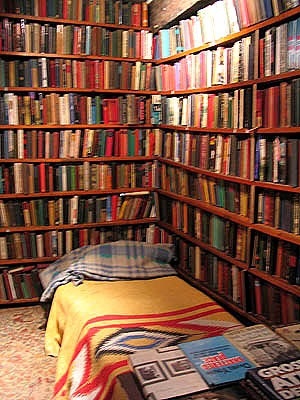 Bookstore as new “book plus” – Teleread also imagines a bookstore as a new “third place” for us (after home and the office) where we’ll have the comforts of home (food, comfortable place to hang out) and the convenience of office outside the office (good Internet connection). Yet we’ll be surrounded by books. In any of these or other forms, the new bookstore might pose a credible challenge to the online bookstores. Higher margins on a larger number of e-book sales could even allow for lower prices for p-books. It seems likely that bringing technology into the bookstore, as well as the economic pressures on bookstores today, will lead retailers to provide customers with an experience that combines the best parts of the old and new bookstore. This entry was posted in book marketing, open publishing, publishing strategy, readership strategies and tagged bookstore trneds, e-book sales in bookstores, future of the bookstore. Bookmark the permalink.